I got back to Osaka after my trip to Tokyo, and was ready to hit some more new shops. On this night I visited Kotetsu, a brand new shop in Shin-Osaka. 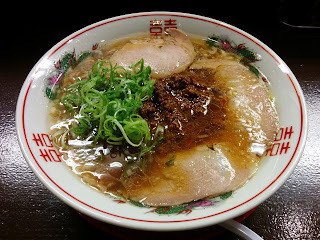 Their menu was simple, which I appreciate: ramen, or niku miso ramen. I ordered the one with the extra meat. The ramen was an oily if middling shoyu; not too light, not too dark, but lacking any major characteristic of its own. The noodles were medium and round, and were missing flavor because the soup was a bit too thin for them. The chashu too did not stand out, but the niku miso was good and added some much needed spice to the bowl. I won't make it back to this place. You can skip this one.